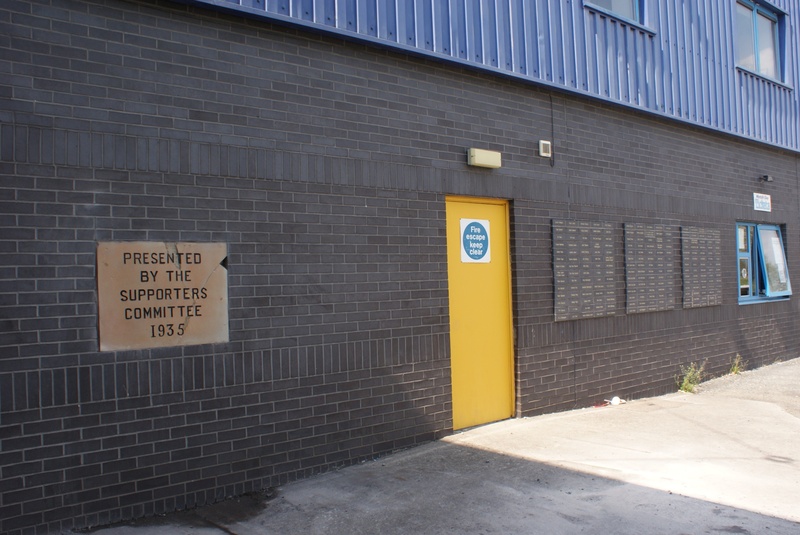 With the restoration of the plaque I thought it would be interesting to collate some pictures of other parts of the Sealand Road Stadium that have survived. I am hoping that this will be the first of a number of articles and I would urge anyone to get in contact if they have anything of interest. 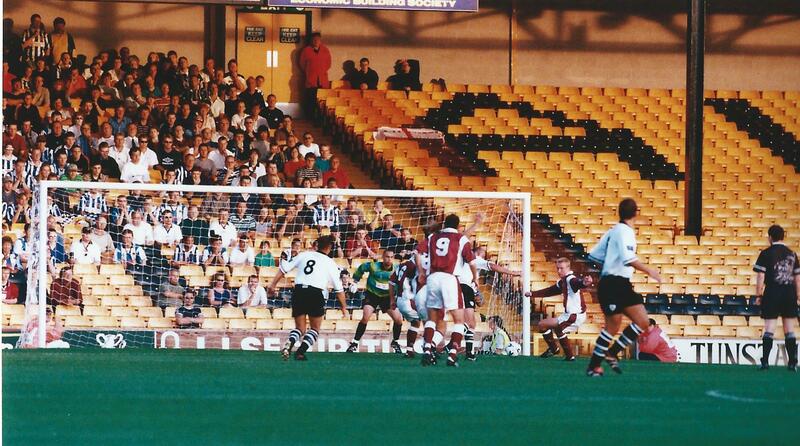 The most obvious place to start is the roof of the main stand which was installed at the previously uncovered Hamil Road End of Port Vale’s Vale Park Ground in 1992. 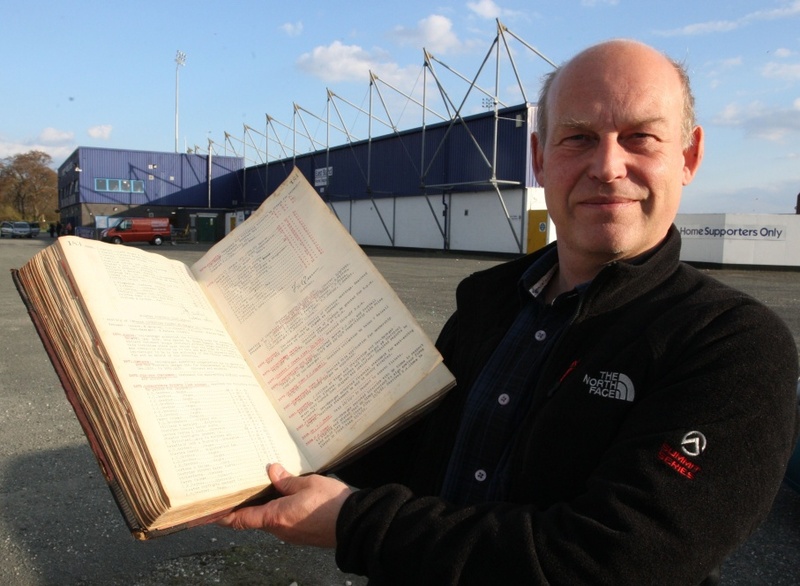 According to Simon Inglis’ Football Grounds of Britain book the stand roof was bought from Chester for a bargain price but the final bill for its transport, re-erection and repainting came to £350,000. 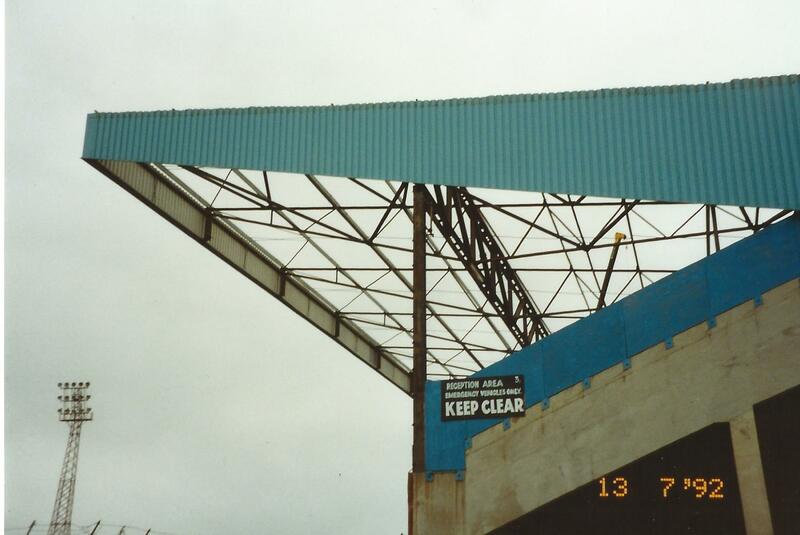 Inglis’ book also states that some surplus roof cladding from Sealand Road was also used at the other end of the ground in the small angled Family stand between the Railway and Bycars Lane Stands. 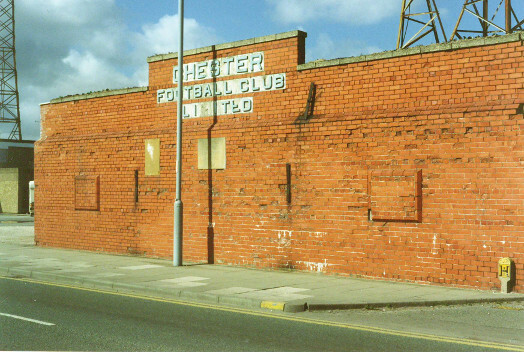 Coincidentally the first team to utilise the new covered Hamil Road End was Chester when they played a League Two fixture at the ground in September 1992 and were beaten 2-0. The following photographs were taken by Fraser Warburton at that game and with no adverts or Vale branding the stand still looks very much like it did at Sealand Road. 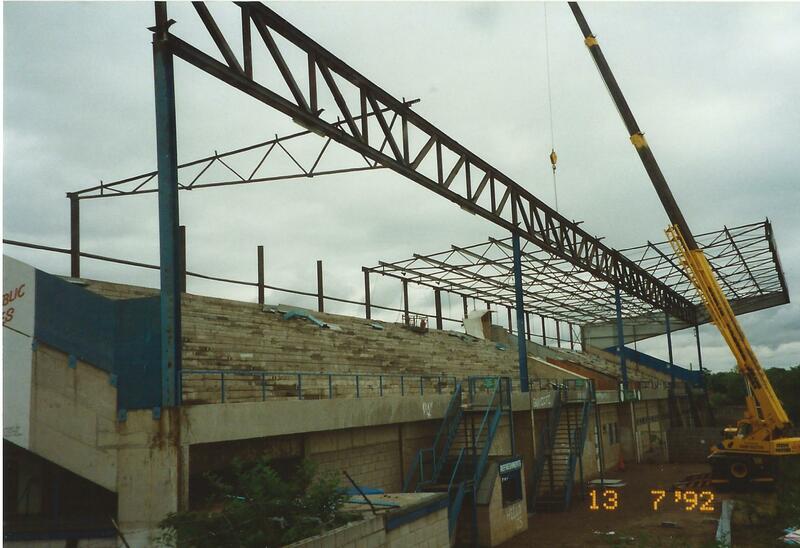 In 1995, 4,550 seats were installed and Blues fans were able to sit under the stand roof for the first time for a Worthington Cup tie in 1998. Two Luke Beckett goals gave Chester a 2-1 victory in that game. 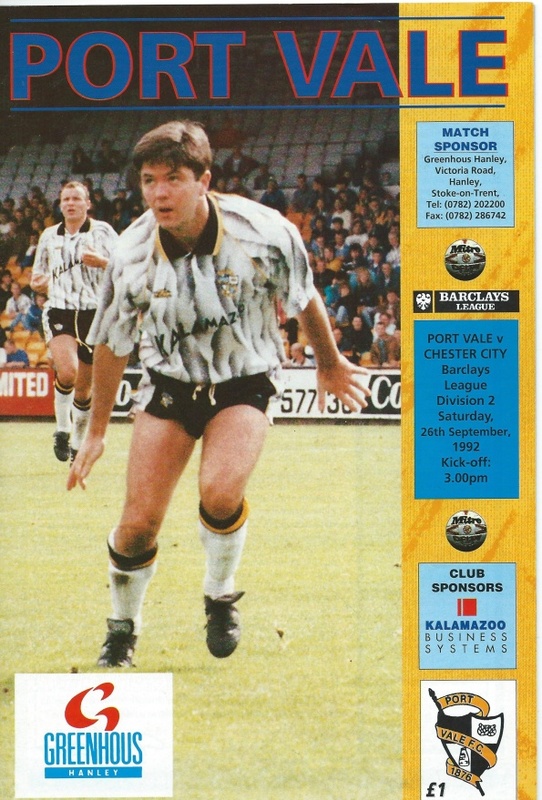 There was a return to the ground the following year in the same competition for that memorable 4-4 draw in Terry Smith’s first game in charge. 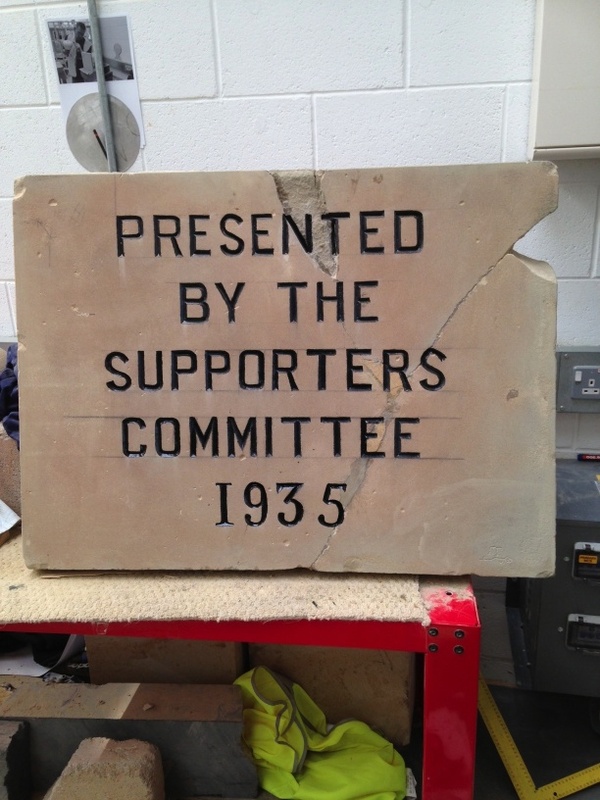 The second item was salvaged form the demolition of the ground in 1992 by supporter Alan Potter who managed to carry it back to his house in Blacon which is quite an achievment given its size. 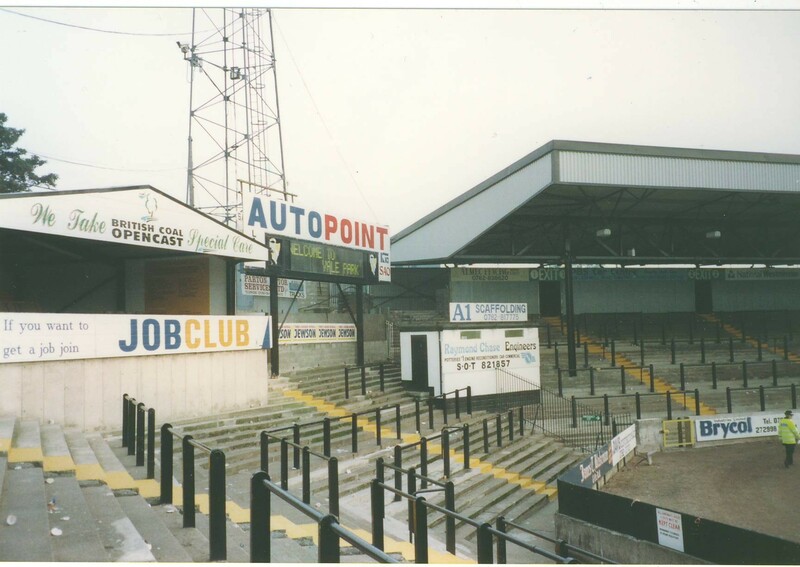 The admission price board was initially in place at the Sealand Road End as can be seen from my accompanying photo. The final item is a gem from the old wooden Sealand Road stand and is the sign from above the away team dressing room that I was given several years ago. The installation was completed last week when Art Graphics of Saltney erected an information board alongside the sandstone plaque. This was followed by an unveiling on Saturday before the players embarked on the victory parade to the town hall. The unveiling was attended by Rob Fleet, who retrieved the broken plaque back in 1992, as well as former ISA chairman George Rogers who had looked after the pieces in recent years. 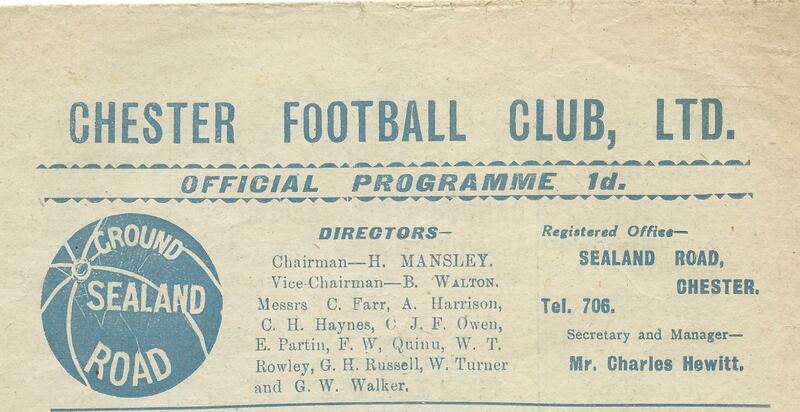 Also present were Pauline Meakins, representing the Chester Exiles who sponsored the information board, as well as Chester FC chairman Tony Durkin and members of the Senior Blues. Before the event I was talking to Rob about the “Chester Football Club Limited” lettering that appeared above the plaque (see the picture in the February 1st article) and wondered what had happened to it. I had always thought they were individual letters attached to the wall but Rob says that they were embedded in breeze blocks and they were too big to remove. It begs the question did anyone salvage a letter as a souvenir? This led me on to another thought. I know that other parts of the ground were salvaged by supporters after the ground’s demolition and I thought it might be a nice idea to put together some photographs and stories in an article. 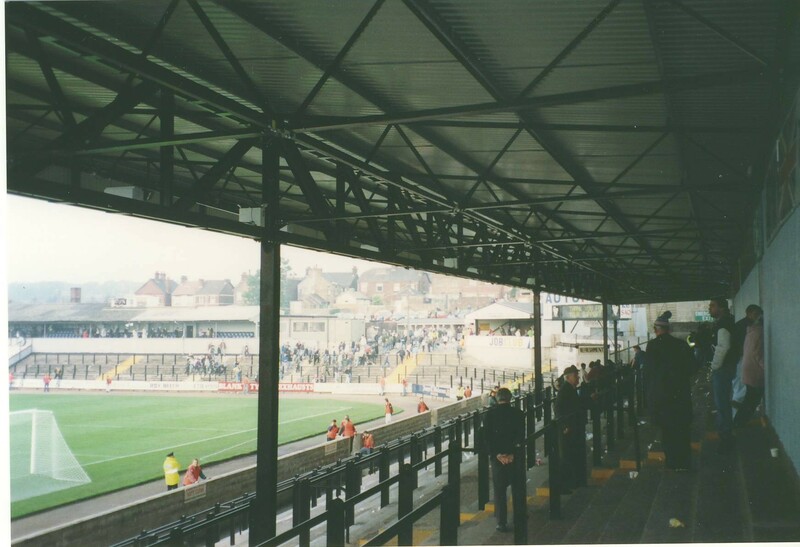 I have already received pictures of the old stand roof in place at Port Vale when it was still distinctly recognisable as coming from Sealand Road. Unfortunately I missed out on taking pictures of the old stand seats which were used at the Greyhound Stadium in Ellesmere Port. These seats have recently been removed but if anyone has a picture that would be great. Please get in touch via the message form below if you have anything of interest or just add a comment. 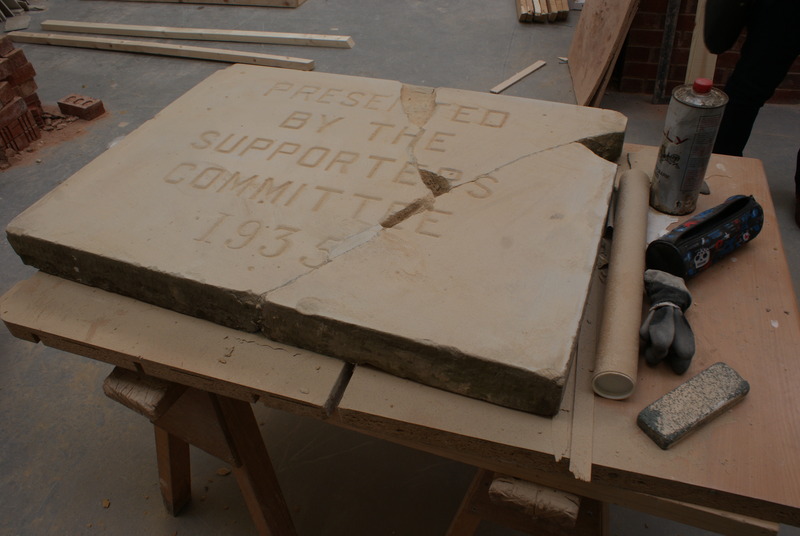 Since my February post there has been significant progress in the project to restore the sandstone plaque to its former glory. 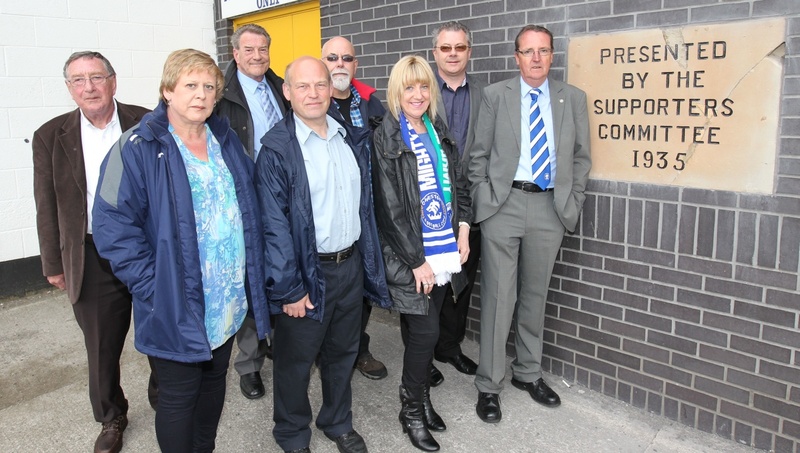 West Cheshire College has agreed to do the restoration work at no cost to the club. This has been made possible through Chester’s Volunteer Learning Co-ordinator Carol Bennett’s connection with the college. 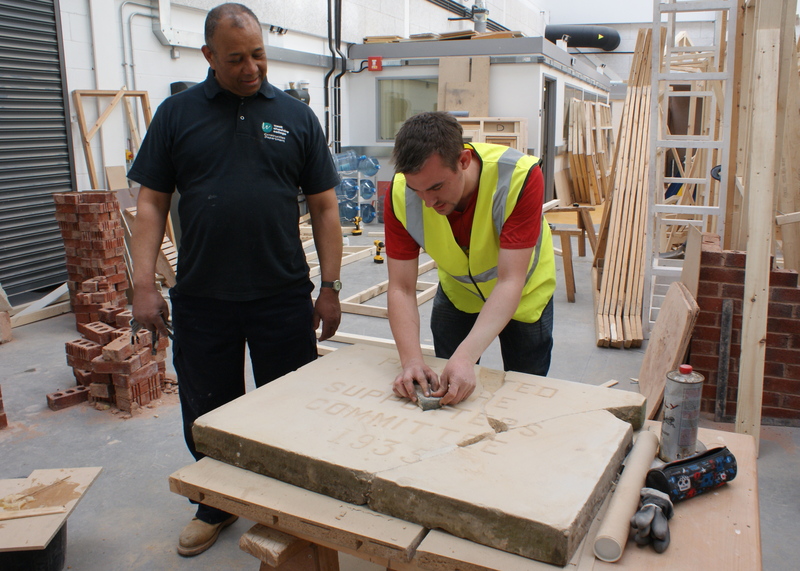 At the end of February we took the three sections down to the college in Handbridge and since then the students, under the leadership of master mason Altomont Townsend, have been hard at work on its re-construction. One detail that has emerged from the work so far is that the letters were initially painted black and the intention is to restore the paintwork to match the original. 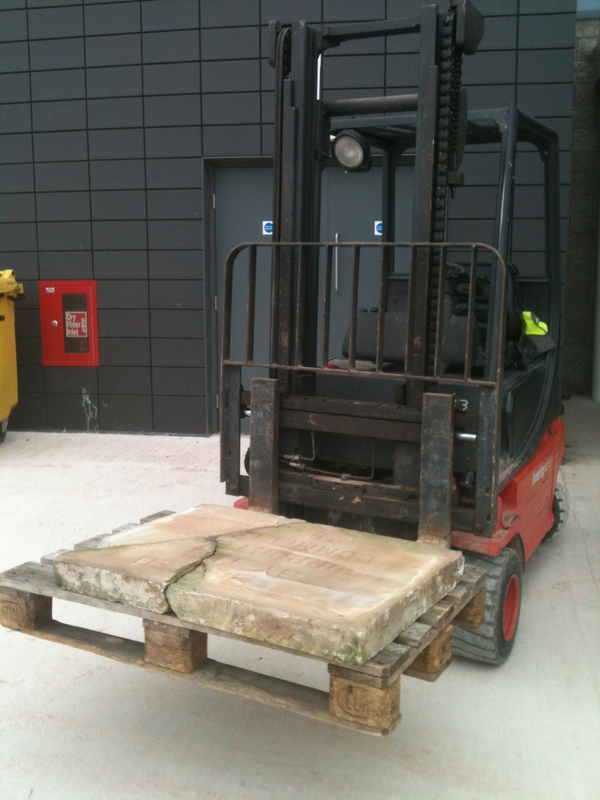 Once the restoration has been completed the next stage will be to return it to the club and arrange for it to be re-mounted on one of the walls at the ground. 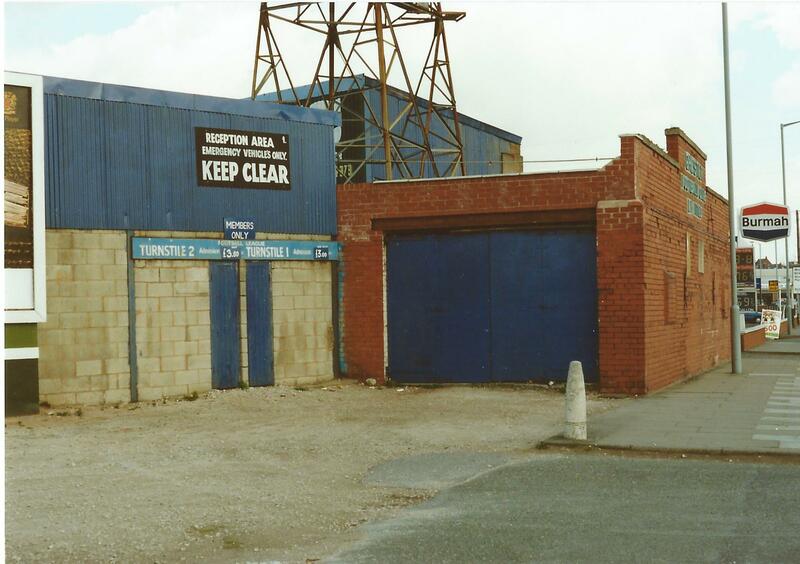 The Sealand Road End in 1990 showing the brickwork that was added in 1935. The plaque is just visible by the lamppost. 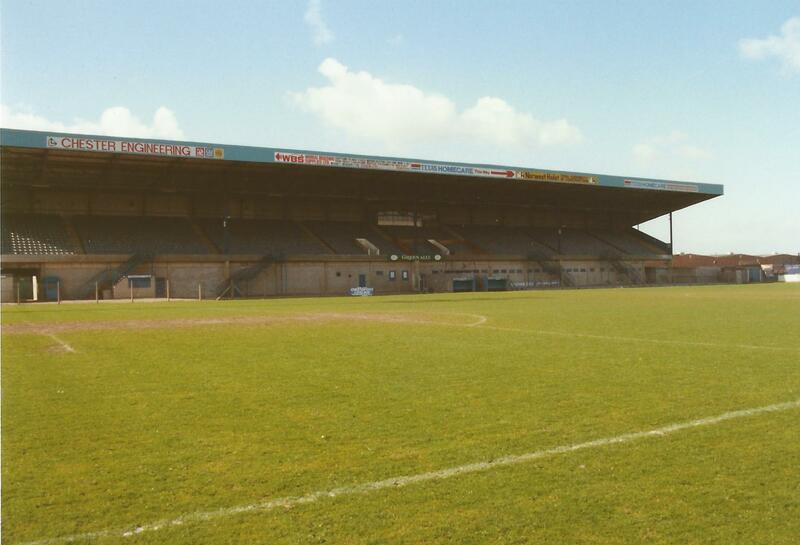 The Sealand Road stadium was demolished in 1992 with the club already in situ on Bumpers Lane. 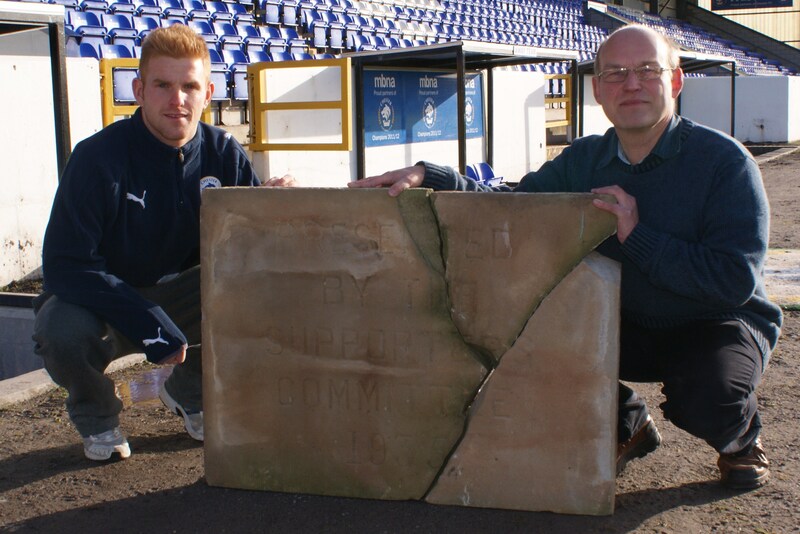 One remnant of the stadium that was believed missing was a plaque presented by the Supporters’ Club in 1935. 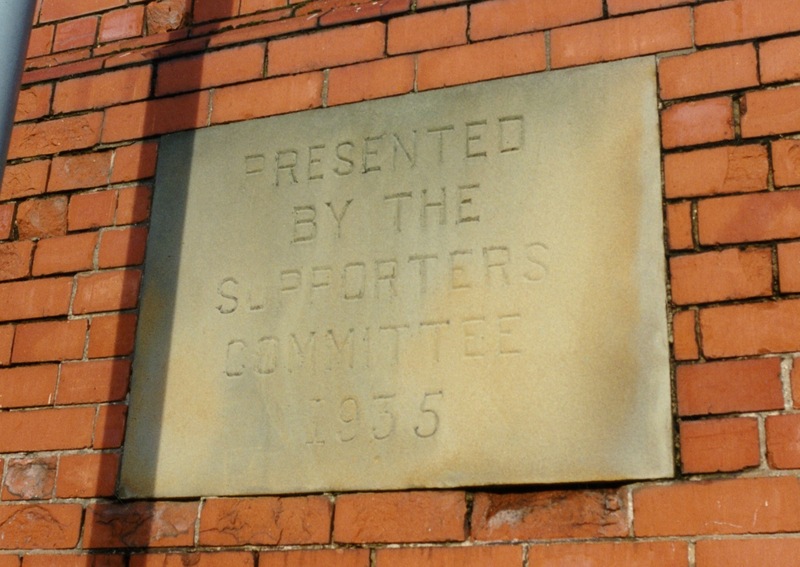 The sandstone plaque was situated on the brick wall at the front of the ground, facing Sealand Road, but partially obscured by a badly placed lamppost. Although the demolition men were asked to preserve the plaque it came down with the wall and was smashed into three segments. However all the pieces were salvaged by a supporter who handed them over to the Independent Supporters Association (ISA) at the start of the last decade. With continued uncertainty surrounding the club the broken plaque was stored away at the home of ISA chairman George Rogers. Now that the club is back in safe hands George attended a recent meeting of the Senior Blues and returned the plaque to the club. 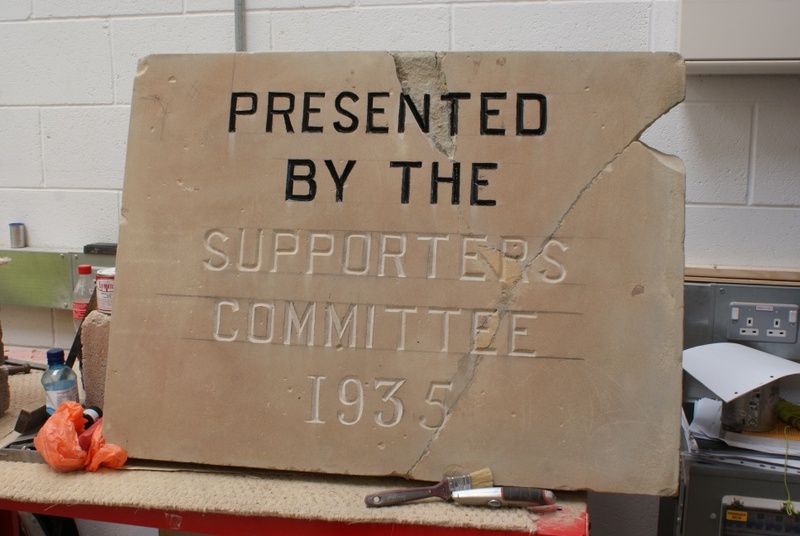 The plaque, which is inscribed “Presented by the Supporters Committee 1935”, has flaked in places and a very small piece is missing but is otherwise in reasonable condition under the circumstances. 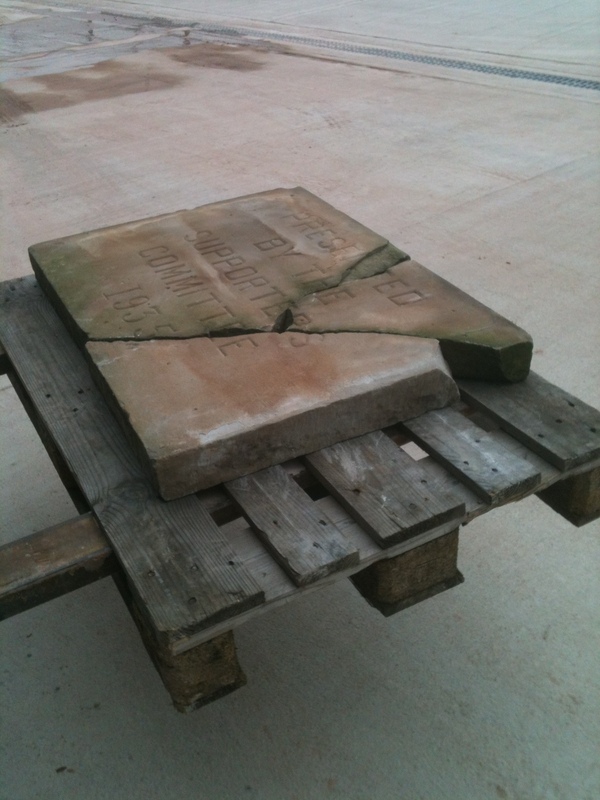 The current intention is to possibly restore the plaque and re-instate it somewhere around the ground. 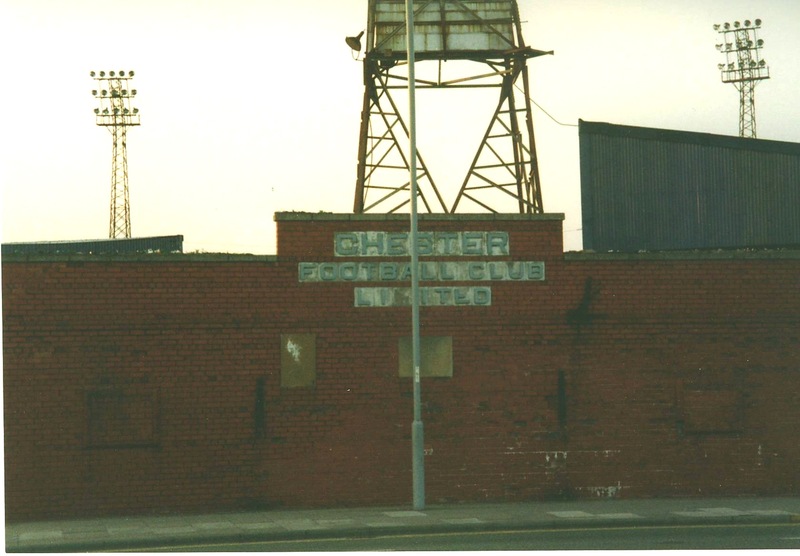 After a burst of activity in 1930 and 1931, when the main stand was extended and the Sealand Road End covered, the supporters were instrumental in the changes in the middle of the decade. In 1934 the rails around the pitch were replaced by a concrete wall. In “On The Borderline” I suggest this was done at the end of the 1934/35 season but I now believe this was done slightly earlier as the wall caused major drainage problems resulting in a poor pitch and many postponements during the 1934/35 and 1935/36 seasons. The problems with the pitch were exacerbated by the construction of terracing on the popular side. This new terracing accommodated 6,000 and was completed in time for the FA Cup tie with Nottingham Forest in January 1935. 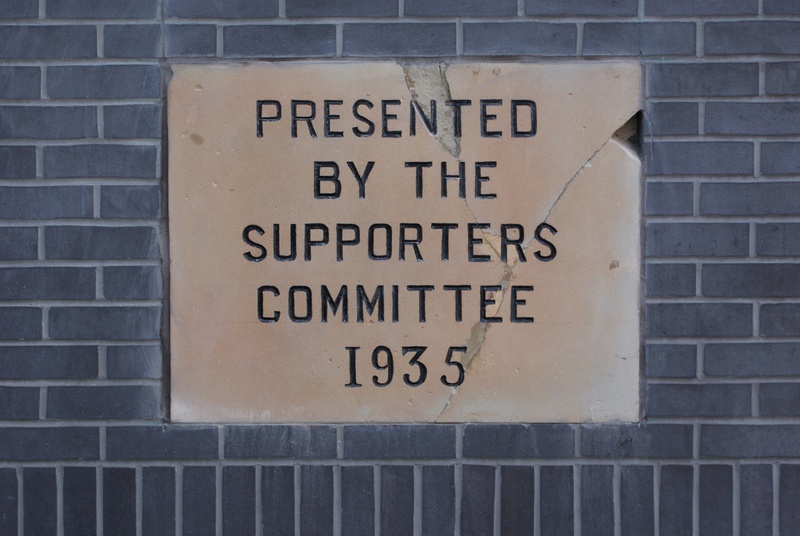 At the start of July 1935 a meeting was held between the directors and the Supporters’ Committee in order to discuss further ground improvements. 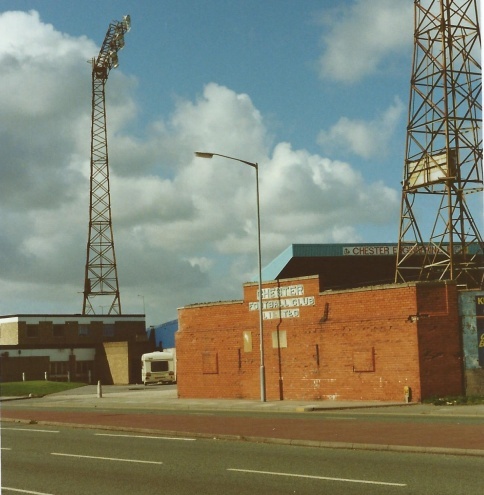 It was resolved to erect boundary walls on the city side of the ground (popular side) and at the Sealand Road End to take the place of the existing galvanised iron sheets. It was also proposed to fit steel girders in the walls of the popular side to prepare for further extension of the covered accommodation. 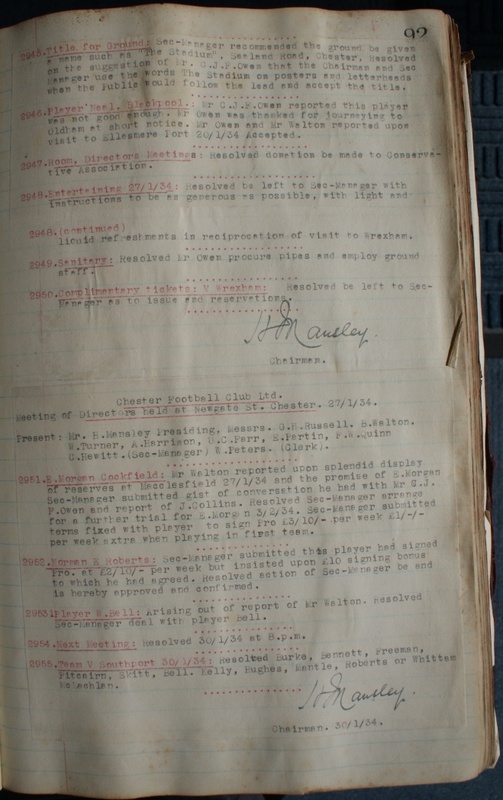 The architect (Mr A J Hayton), on behalf of the supporters, was instructed to prepare the plans and invite tenders from local firms with the intention of completing the work in time for the first game of the 1935/36 season. In the event the surrounding walls and popular side cover were both completed during the summer although the cover did not extend the full length of the pitch. 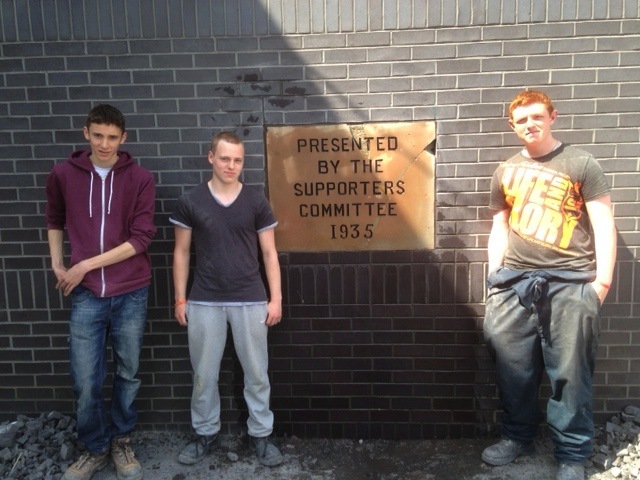 It is this work that resulted in the plaque being placed on the new wall at the Sealand Road End. As a postscript, in the first week of January 1936 the city was battered by a severe gale which caused several hundred pounds of damage to the ground. 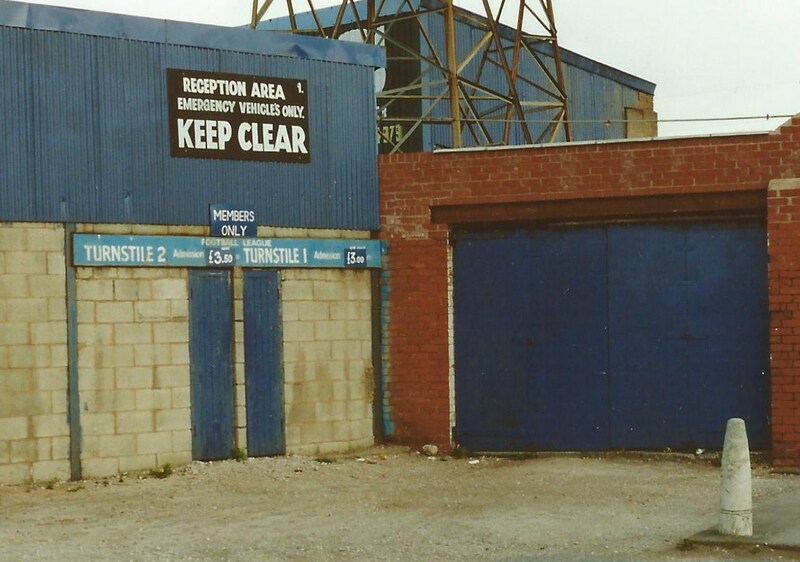 The new wall, erected by the Supporters’ Committee at the Sealand Road End, was severely damaged and the large entrance gate completely smashed with a side wall also demolished. 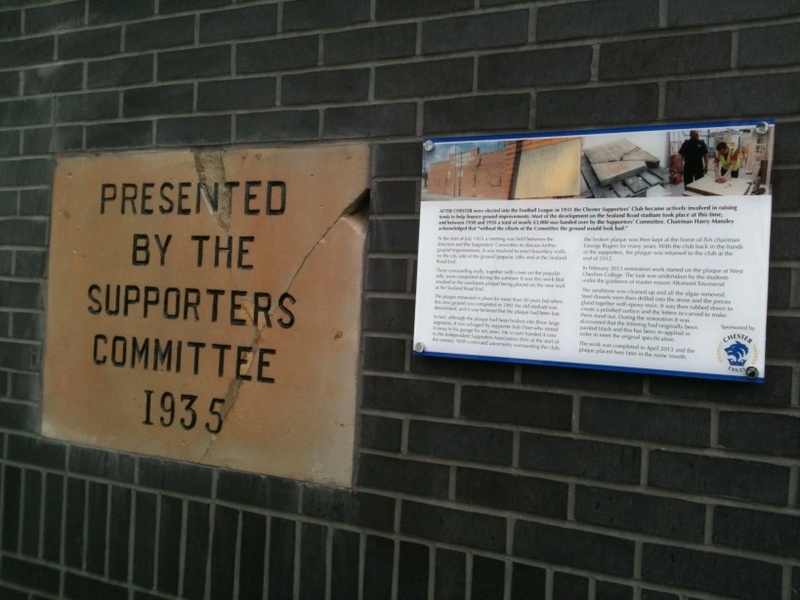 Fortunately the section of wall directly facing Sealand Road (where the plaque was erected) remained undamaged. 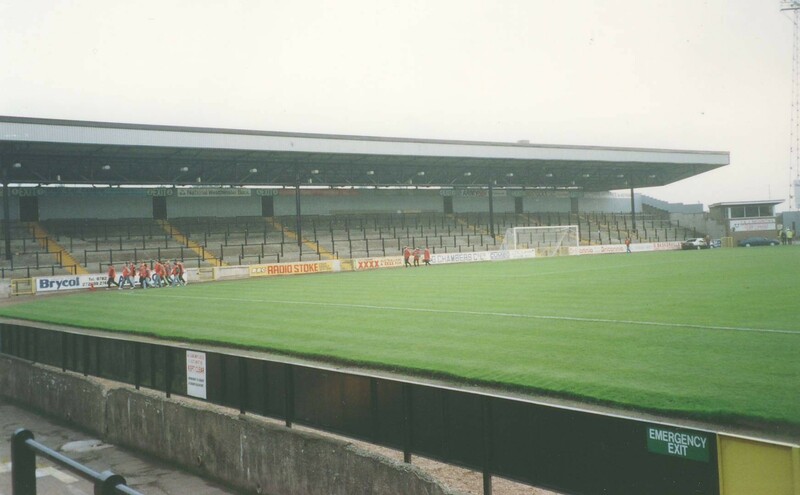 In addition a 90 yard section of fencing behind the Spion Kop, which had not been included in the summer changes, was completely flattened and had to be boarded up in time for the home game against Gateshead. I would be interested to hear about the recovery of the plaque in 1992 so please get in touch if you know its whereabouts between 1992 and the early 2000s. Marc Williams, me and the plaque.